‌The page below has been superseded by The Illusions Index, which we hope you'll visit! The Illusions Index is a fully searchable curated collection of illusions. The illusions are categorised into different types, allowing you to search for and compare illusions that fall under one or more type. Researchers have provided detailed information about what each illusion teaches us about the philosophy and psychology of perception. A library of visual and auditory illusions, curated by the Centre for the Study of Perceptual Experience. Click on the headings below to view examples of illusions in each category. One for academics: book or cleavage? How many circles can you see in this picture? Focus on the cross and they'll start to appear! Notice that when one triangle seems to point in a certain direction so do all those around it. An illusion similar to the Necker Cube. You may wish to read Fiona Macpherson (2006) "Ambiguous Figures and the Content of Experience", Nous, 40(1): 82–117, about experiences of ambiguous figures and their philosophical significance. Many of Escher's pictures depict impossible figures, such as Belvedere. These photos show a piece of wood that when looked at (or photographed) from the right angle appear to be of an impossible triangle. These pictures show a sculpture in East Perth, Australia that, from the right angle, looks to be an impossible triangle. To learn more about impossible figures you may wish to read Fiona Macpherson (forthcoming, 2009) "Impossible Figures", Sage Encyclopedia of Perception, edited by E. Bruce Goldstein, Thousand Oaks, CA: Sage Publications, Inc. The two images of the tower are identical although the one placed on the right looks to be leaning more. The two central grey squares are the same colour. The two central green squares are the same colour. The two central pinkish squares are the same colour. The red colour is the same across this band. In this picture on the left the shades of colour that look to be different shades of blue and green are in fact the same shade. They look to be so different on account of the shades that surround them. You can see this clearly when all colours except the blue and the green have been blacked out, as is the case in the picture on the right. The square marked A and the square marked B are the same shade of grey. Please stop looking at the images if they cause you to feel dizzy or unwell. These images were created by Akiyoshi Kitaoka. 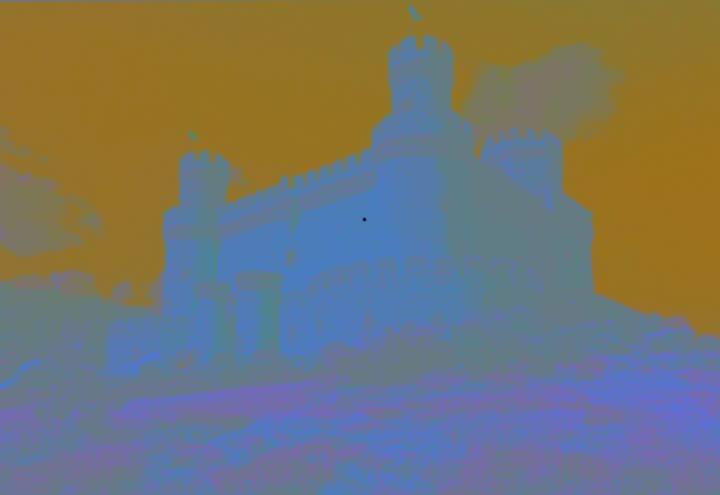 The images are stationary and only appear to move. "Boats" - The boats appear to move in a clockwise direction. "Rollers" - the rollers appear to rotate in different directions. "Rotating Snakes" - the circles appear to rotate in different directions. By fixating on the bottom right corner of the yellow rectangle for 30 seconds or so and then looking at a white surface and blinking a few times, one can have an after-image of the American flag in the correct colours. An effect similar to after-images in certain respects, but perhaps even more vivid, can be got by first staring at the picture below and fixating on the centre spot for 30 seconds. Afterwards, roll the mouse over the picture and keep fixating on the centre spot (this is important). You seem to see the picture in colour even though it is really in black and white, as you can easily verify. These images are taken from John Sadowski and on one of his webapages he provides a tutorial on how to make such pictures. Fixate on the centre of the rotating spiral for 60 seconds and then look at a non-moving surface - preferably one with a pattern on it, such as the pattern below it. Note the illusion of movement when looking at the stationary pattern. The motion after-effect is also called the waterfall illusion. See a waterfall-style version of and read about its connection with Scotland here. The tones below sound as if they are ever increasing or decreasing in pitch. However, this is only an illusion. The same sequence of notes, an octave, is simply being played over and over again. The illusion is an auditory equivalent of the apparently ever rising lines on a rotating barber’s pole or the steps on Escher’s lithograph ‘Ascending and Descending’ (below). The illusion is created because each note is composed of many pitch frequencies that are carefully crafted to create ambiguity and hence this illusion. See Shepard, R. N. (1964) “Circularity in Judgments of Relative Pitch”, The Journal of the Acoustical Society of America, Vol. 36, No. 12, pp. 2346–2353. Further information: J. C. Risset (1986) “Pitch and Rhythm Paradoxes: Comments on ‘Auditory Paradox Based On Fractal Waveform’,” Journal of the Acoustical Society of America, 80(3): 961–962. Some modern music exploits these effects. For example: ‪Astronivo & DJ Zombi‬ Anything You Want (Miki Litvak & Ido Ophir Remix) and ‪Christian Smith & John Selway‬‪ Total Departure‬. Binaural beats are a form of auditory illusion in which the perception of two distinct, but very closely related pure sine wave tones played dichotically (one to each ear) creates the illusion in the ear of a third tone, or ‘beat’. The difference between the two frequencies dictates the frequency of the beating per second, so a difference of two hertz leads to two beats per second, and as the frequency difference becomes greater it becomes more difficult to distinguish the individual beats. Change blindness or inattentional blindness occurs when one looks at a picture, video, or real life scene and fails to notice certain changes taking place. There are a number of different types of example. An early and now famous example involves a video of people playing basket ball devised by Daniel Simons and Christopher Chabris. You are asked to count the passes that the white team make. Did you spot the unexpected? Other examples consist of a picture in which one (sometimes rather obvious) detail of the picture changes. During the time the picture changes either 'mud splashes' appear on the picture or the picture flickers. (Note the mud splashes do not cover the change.) When this happens people are not aware of the change that takes place in the picture. Without the mud splash or flicker the change would be easy to spot. Another example consists of a picture that changes slowly. Can you spot the difference in the picture? It is easy to think that there are no changes in the above examples and get frustrated. There are changes. Finding them can be difficult because the examples are very good. E-mail me if you really need an answer! Finally, you might like to have a go at the following magic trick. The Flashed Face Distortion Effect – see beautiful people as they might appear in your worst nightmares!